Advertisers fully maximize the internet in promoting particular products. This may be advantageous to the commercial sector, but it is not always the case especially for those working with computers like me. Ads eat up load browsing time and make it hard for me to find significant web content. 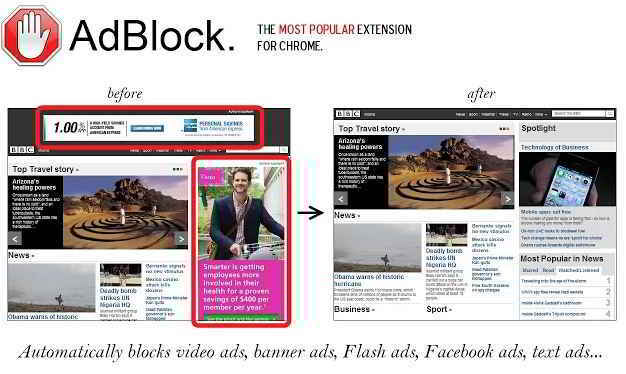 That is why when I found out about ad blocking applications, like Chrome AdBlock, I immediately tried them. My work mainly involves lots of researching and reading online and with ads popping on the web pages I browse, it is very annoying and even disturbing most especially when meeting up deadlines. Moreover, ads slow down browsing load time and affects work productivity. Adblock proved to be a trademark of Firefox web browser. This is because Firefox’s popularity can be partly accredited to its adblock extension. Now, Google Chrome has its own set of ad blocking programs; and here are some of the best adblock for Chrome web browser.